These sweet little mushrooms were designed by my dad. He makes many pieces for garden decorations. Step 1: Add just enough water to the concrete to make the mixture stiff enough to stand up on it's own. (The amount of concrete you use depends on how many mushrooms you are planning to make.) Mold the mushroom stem on a piece of plastic wrap, as seen below. Let the stem dry. With our cool weather, I let it sit for a full day to dry completely. Step 2: Fill your bowl with damp sand and cover it with plastic wrap. Step 3: Using your hands, or a previously made mushroom, or any object that is mushroom-shaped, make an imprint in the sand on top of the plastic wrap. This will be your mushroom mold. Step 4: Mix concrete that is softer than the concrete mixed for the stem. Then fill the mushroom mold with this mixture. As you can see below, I mixed too much water into the concrete and it is running over the edge of my mold. It will be ok because I can file down or chip off unwanted concrete after the piece is dry. Step 5: Place the dry stem into the wet concrete as seen below. If it seems like it won't stay in place, the trick is to simply hold it where you want it to be for 30 seconds or so. You will see that it stays right there after that. This also works if your mushroom-top concrete is rather thick and it seems like the stem won't go in. Just hold it there with gentle pressure. Interested in winning a FREE mushroom? Visit this post to enter the giveaway! Good luck! Amazing, I love it! I definitely will have to give this a try!! Such a cute and wonderful idea! Thank you! Thanks! I hope your's turns out super great! Hi! LOVE this idea; thanks for sharing. We bought an 80 lb. bag of cement. Would you have an idea of about how many mushrooms this will make? Oh. My. Goodness. I just realized I made a mistake in this post! It is actually CONCRETE, and not plain cement that is used to make these! I'm going to change it in the post. I just asked my dad and he said an 80 lb bag of concrete made 100 mushrooms for him. It may vary depending on variations in the size you make. That sounds right to me! My concrete had pebbles, and fiber-looking things, and powdery cement-looking stuff. I bet your's will turn out great! Whew! K, D, and I were just looking at the picture of all the mushrooms and trying to figure out which one was ours. I think we identified it :). You guys are too cute:) Love it. I love these, thanks for the great idea! I've made several concrete leaf bird baths so fun & easy. Everyone loves them. Oh, thanks. So glad to spread my dad's idea here. He's made all different sizes of mushrooms, and even turned some into adorable bubbling fountains. I love those leaf bird baths too. Well I have now made about 30 of the mushrooms (in 2 nights)! They are so fast & easy, the hardest part is waiting for them to dry so you can see the results! I'd love to see pictures of other things your dad has made. These are so cute! I love them? Do you think the same technique would work if they were a lot bigger? Maybe a big plastic bowl for a mold? What type of paint did you use? I used acrylic craft paints. now i know what to do with the extra quick-dry cement left over from my patching projects! thanks! Perfect! Hoping they turn out great! Christina! Those mushrooms you made are so cute!! Great photo too! I'm so glad you had success with them, and thanks for sharing. I'm in love! I'll make these for when all the flowers are withered in our... let's just say garden, and paint them in all colours under the sun. That'll keep away the nasty winter blues, and I can force the kids to help me make them :D Thanks for this, I think I found exactly what I needed to keep me happy during winter. THANK YOU!!! Wonderful idea! Will be making some of these for my mom's fairy collection! THANKS! They will go perfectly with fairies! I hope you enjoy making them. How cool is that! I love it. love this,will be making these for my faire garden and will be looking forward to more of your dad's crafts. I have been experimenting with your technique. I have made several small ones and some really large ones. Some are sand casted and some are made from molds using bowls, cups and vases. I love the way these look, they will also make a fun kids project. That is super cool, thanks for this post. It looks like so much fun and you could use it for so many things. Cute, but the way the weather has been in the Northeast, we have the real thing!! Will make some for camp! Thanks for the ideas! You are very clever! I know this is a silly question, but what is the purpose of the plastic wrap? Do you end up cutting/tearing it off ? Awesome idea, I'm going to Walmart tonight to get concrete. I have every thing else. But whats up with the plastic over bowl then steam? Whats up with the plastic over the bowl.? The plastic keeps the concrete in place. I sprayed mine with some cooking oil. It also creates texture on the top of the mushroom. I wonder if you could go without the plastic and place some mosaic tiles in the sand as an indirect method. Might try that next. Can!t wait to make these. They will be an awesome addition to my fairy gardens! Bought some concrete and made these with my grandkids...awesome. Yes make sure you buy concrete and not cement. The consistency is like clay when you make the stems, super easy for the kids to do. Will be making more so they can have a mushroom stand this summer. Thanks so much for the idea. Do you give the mushroom a BASE COAT such as GESSO OR any other sealer before painting with acrylic?? This will be perfect for my fairy garden. I'm so excited to get started. Thanks for posting this! So cute! I can hardly wait to make them for my shade garden that doesn't have a whole lot of color. I will probably make a bunch of small ones & considering using an egg carton as the mushroom top mold. Thank you!!! I would like to purchase some. Please contact me missalfred123@yahoo.com. super decorations for in a flower garden with a few gnomes or fairies!! Thank you so much for sharing! We are getting married next summer at a cottage in the woods (It's a beautiful setting with a creek that runs through the property) and I wanted to do something different (and more affordable) for the souvenirs. I love this idea and it should keep me busy (I'm a stay at home mom to a toddler ��). Thanks again!! What a beautiful idea ! I love toadstools. I made a couple of large ones for my garden out of a couple of smaller unsplit logs and a couple of heavier plastic bowls. Predrilled the holes on both pieces and painted the bowl as my top. Oh, I also drilled a larger hole in the bottom of my log before setting up to place a heavier tent spike to hold it in place. 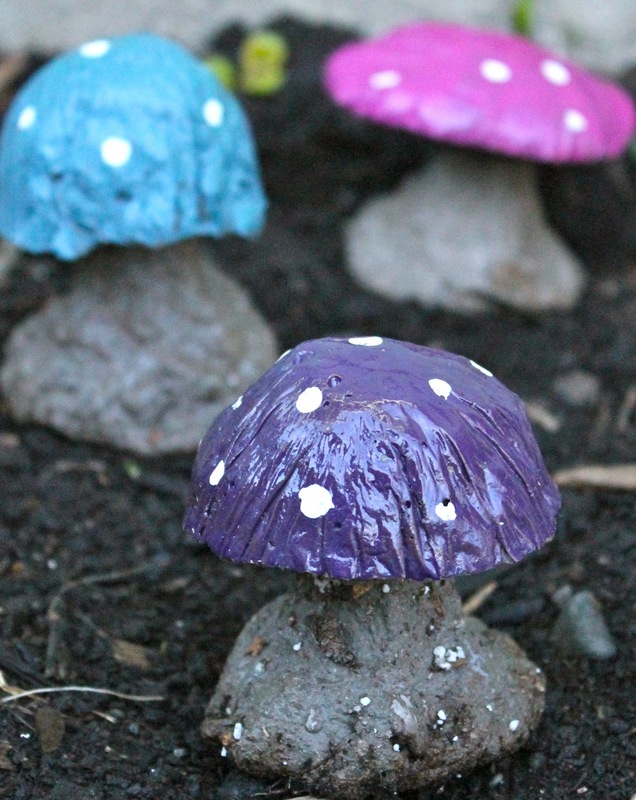 The mushrooms are so cute.Helpful diy tutorial.I'll have a try.